Are you looking for a software to manage all costs and activities of your vehicle within only one application? You have found that! And it is FREE! With more than 10 years of experience in car care software development and more thousands downloads during the years, I have a solution for you! This solution is the eMyCar-Monitor which has been developed for tracking as much information related to any motorized vehicle as possible, e.g. cars, motorcycles, trucks, flights, boats or power machines. eMyCar-Monitor includes all essential elements which are needed to manage vehicle information for home users or small business as well. 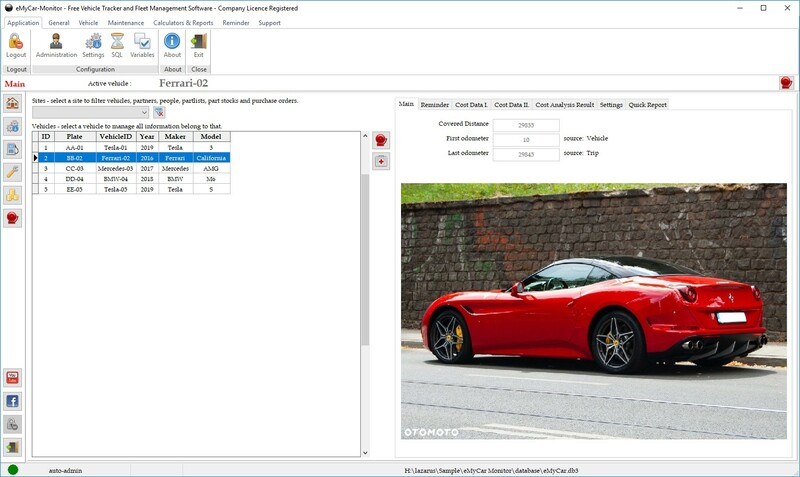 Additionally it includes all important functions, which were part of MyCar-Monitor and mcAutoTrack, as this application is the common successor of them. Because of this, it is able to import databases of both applications. Most of us, who care about their cars, only record two or three main things, fuel consumption, services and additional costs, but it provides more. Main modules are: vehicle data, employee, contact, document, part list, purchase order, part stock, service item, reminder, fuel, expense, internal message, reports, income, accident, breakdown, service, service plan, work order, tire, trip, note and others. eMyCar-Monitor is a complete solution for vehcile owners at home in business as well. This page was last modified on 11 February 2019, at 16:52.